Can govt make up for shortfall in GST revenue collections? Meeting the budgeted fiscal deficit target for the year looks difficult, especially in light of unimpressive revenue collections from the goods and services tax (GST) so far. 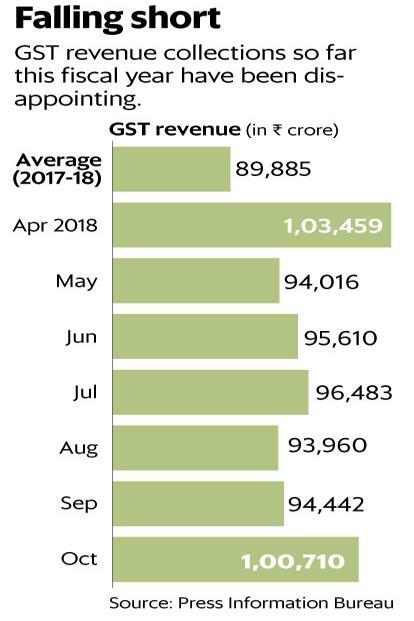 GST collections in the first seven months of the year were 13% below the budgeted ₹1.12 trillion per month average, analysts at CLSA pointed out in a note to clients. If the trend continues, there is likely to be a shortfall of well over ₹1 trillion in GST collections for the year, they added. Revenue collections from GST stood at ₹1.01 trillion in October. This is only the second time since the implementation of the indirect tax that collections have surpassed the ₹1 trillion-mark. Some tax experts point out that October is a seasonally strong month, based on the historical indirect tax collections. Given the increase in business activity ahead of the festival season, the surge is not surprising. But if the monthly average target can be met only in seasonally strong periods, it’s clear that the yearly target was far too ambitious. As a result, the required GST run-rate continues to inch higher. Some tax experts are now working with a revised monthly GST revenue ask rate of ₹1.20 trillion from ₹1.15 trillion earlier. In this scenario, what choices does the government have to make up for the shortfall in GST collections? One of the options it seems to be pursuing is to rely on a large dividend from the central bank. Or, the government could hope that the direct tax revenues see more buoyancy in the rest of the fiscal year. Till now, India’s direct tax collections in the six months ended 30 September are 38.6% of the budgeted estimates of ₹11.5 trillion for FY19. Clearly, it would be foolhardy to expect miracles here. Then there are the non-tax revenue collections. Divestment of public sector stakes may have been a good option. Till 30 September, the government has divested public sector equity worth about ₹15,000 crore. That is a far cry from the government’s divestment target of ₹80,000 crore for FY19. Dividends from public sector firms too are an option. However, according to Madan Sabnavis, chief economist at CARE Ratings, dividends by public sector units haven’t been very impressive and one is unlikely to see a huge increase there. Last but not the least, the government could look at reducing its expenditure. Kotak Institutional Equities believes without expenditure cuts, it will be difficult to stick to the budgeted fiscal deficit target. “We maintain our GFD/GDP estimate at 3.5% factoring in reduction in capital expenditure and some increase in revenue expenditure to factor for higher food and fuel subsidy,” said analysts from Kotak in a report on 1 November. GFD stands for gross fiscal deficit. It’s important to note that even though global crude oil prices have dropped lately, average prices for the year are expected to remain higher, and will weigh on the country’s import bill and eventually the fiscal math. As far as cutting expenditure is concerned, taking a call on that will not be easy given this is a pre-election year. In short, there is limited scope for the government to make up for the insufficient GST revenue collections; a miss on the fiscal deficit target looks unavoidable.